We spent a good amount of time in the cage and on the field with the 2016 VELO. Our 9 year old player, who weighs right at 65 pounds, fell in love with the 2016 VELO drop 12 2 3/4 two piece composite. The 30/18 has a respectable size barrel and the added weight in the hands increased his contact percentage remarkably when compared to similarly sized, yet end loaded bats like the 2016 Voodoo Raw. The VELO clearly lacks some jaw dropping power that can be found in … Jump to the full review. We aren’t the only ones to have information about the Velo. Other places, in particular those who sell bats, usually have a boiler plate write up on the specs of a bat. Many of those we reference to make sure we are seeing what we should be. Here are some more references for the 2016 Rawlings Velo review. The 30/18 has a respectable size barrel and the added weight in the hands increased his contact percentage remarkably when compared to similarly sized, yet end loaded bats like the 2016 Voodoo Raw. The VELO clearly lacks some jaw dropping power that can be found in other sticks (like the Rawlings 5150) but for many hitters the name of the game is getting the ball in play, not sending it out of play. Regardless of the class of bat (BBCOR, Senior League, Big Barrel, etc.) the VELO ranks as a remarkably light swinging baseball bat. The 2016 VELO, like its predecessors, serves a significant part of the market for those looking for bat speed and an increased ability to put the ball in play. Searches like this on Amazon and eBay tend to bring good results. The 2016 VELO single piece baseball bat is found in the BBCOR, 2 5/8 Senior Barrel and the 2 1/4 youth barreled bat. This bat, like the 2015 version, is a remarkably light swinging bat with a hand loaded weight distribution. The light swing is created by a composite end cap that extends itself to well into the barrel of the bat (about 3 inches). This extended composite end cap also allows for a larger barrel when compared to other single piece alloy designs (like the Rawlings 5150 (Amazon $155)). Rawlings' claim that their hand-loaded version is significantly 'balanced' sells this bat short. The VELO’s success has come from lowering the swing weight and increasing the barrel size of an average bat. These features can dramatically increase contact percentage. As such, hitters looking for as much bat speed as possible should be considering the VELO. On the flip side, it should be noted, the VELO’s lack of swing weight is also the reason the bat lacks some gumption at impact. 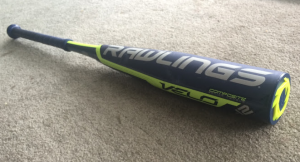 The lack of jaw dropping power doesn’t mean the 2016 Rawlings VELO isn’t recommendable. On the contrary, for a hitter who needs more bat speed and bat control, the one piece VELO could be the perfect choice. JustBats purchased the exclusive rights to the CAT 6. That is, the updated look on the CAT 6—with the red base and white accents—is a JustBats only bat. The expectation, as far as we understand it, is that such will be the case indefinitely. Making such an arrangement, as far as know, a first. Of serious note, the 2 3/4 barreled 2016 VELO is a two-piece full composite baseball bat. This will be the first traditional two piece composite Rawlings has ever made. Rawlings claim is the two piece composite is built with durability in mind while maintaining the light swing weight we’ve come to appreciate in the traditional VELO. The two piece design, as well, will add the sting dampening value of multi piece bat. We took this brand new two-piece composite in the cage and are confident in claiming it is a legit top shelf performance bat. Its sting dampening and pop give it feel similar to a light swinging Easton MAKO, albeit the VELO’s barrel is smaller. A drop 12 VELO has its work cut out for it as there is not a more competitive niche in the space than the senior league big barrel two piece composite space. We are not sure what to predict in this case but, considering Rawlings’ far reaching distribution and the consumer confidence in the VELO bat line, we’d guess it will do just fine. The two piece composite release in the 2 3/4 line will be an interesting experiment by way of seeing how much market share Rawlings can take from some other very serious players in that space. In the performance space, there are four versions of the 2016 Rawlings VELO (Amazon Price Check, ebay). Three of those (BBCOR, 2 5/8 Senior League, 2 1/4 Little League) are just color ups from the 2015 version (which we reviewed here). The fourth bat, which comes with major upgrades, is the 2 3/4 big barrel version—which is a new two piece composite bat for 2016. The Rawlings VELO, along with the 5150 and Trio, make up the full line of performance bats in Rawlings 2016 line.